With the constant travel we've been doing lately, some of the things we're loving at this moment in time are the items that have saved us as we've been on the go. This week we're sharing a mix of travel items and some bits we're looking forward to as we head into Fall! 1) How we stay wrinkle free on the go! In the course of my existence, I have always resigned myself to the fact that I will have to wear wrinkly clothes when I am on vacation. It's simply a fact of life, right? Well, not with that attitude missy! Luckily, there is actually a pretty excellent solution: this travel sized steamer came along with us on our recent trip to Italy, and it is without a doubt the best accessory we brought with us! This little device enabled us to look ever so slightly less like frumpy American tourists. BONUS! This cute (and very effective) steamer is only $19.99 right now at Macy's! 2) The amazing little book that will keep you endlessly entertained! This conversation-stimulating book of questions - I first learned about this amazing little book from a colleague about two years ago. The book was written by a psychologist who intended each question not just to help you learn facts about one another, but to prompt discussions amongst those answering as you process through why you would answer in a given way. We have used these in our office to help us get out of a rut with work and to get to know each other, but I love using this on long road trips with friends! I also mentioned this book last year in our Holiday gift guide, but it's worth mentioning again because it never fails to generate really interesting discussions! I see you, yes you... over there... the snarky one mocking all the Basic Betches as they instagram their PSLs at Starbucks while wearing checkered blanket scarves and booties and throwing leaves into the air. I see you, and I know you, but you probably haven’t tried Siggi’s Icelandic Yogurt pumpkin spice. You can mock the latte all you want, and you can mock all other aspects of basic-ness, but you will be missing out on one of the best multi-sensory experiences in life if you actively avoid all things that incorporate pumpkin, or the actual blend of spices that comprise "pumpkin spice". Is there anything sweeter than biting into a warm piece of pumpkin bread with a slather of salty butter on top? The SMELLS! The texture! The WARMTH! The FLAVORS! Bring on ALL the cinnamon, cloves, allspice, nutmeg, cardamom, ginger (ok I know these are not all traditionally in a pumpkin spice blend, but I'm expanding the definition to suit my own tastes) all season long, por favor! Siggis Pumpkin spices yogurt is one of my favorite ways to regularly consume pumpkin treats because it is subtle and natural and high in protein. Voluspa candles are by far one of our favorites! they last FOREVER and the scents are subtle and divine! For fall we love the "Cinnamon Ceylon and Copal" scent or the "Baltic Amber" scent. Far more subtle and complex than your typical Fall candles (no thank you vanilla-sugar-cinnamon-spice-country-pumpkin candle!) These scents are timeless and classic blending smooth, musky undertones with lively spiced notes that are perfect for Fall! I also love the "Bourbon Vanille" and "Blond Tabac" scents for Fall and into the holidays and winter season! For Christmas I'm 100% IN LOVE with "Branche Vermeil"
Moody Colors. We've been rounding up some of our interior inspiration on pinterest- you can see some of our current favorite dark and moody decor! Have a peek and let us know what Fall decor you're loving. As we are re-doing our second bedroom, we're keeping this inspiration in mind. We want the room to be white so it can be used for filming and photos, but will be folding in some moody decor and accent pieces! GO VERTICAL! As we've begun working to re-design our second bedroom, we are looking to pack a punch with the decor AND functionality. One thing that is really important to us is to make better use of our walls to add vertical storage. Based on the layout of our room, we will likely achieve this through an open wardrobe system along one of our walls. 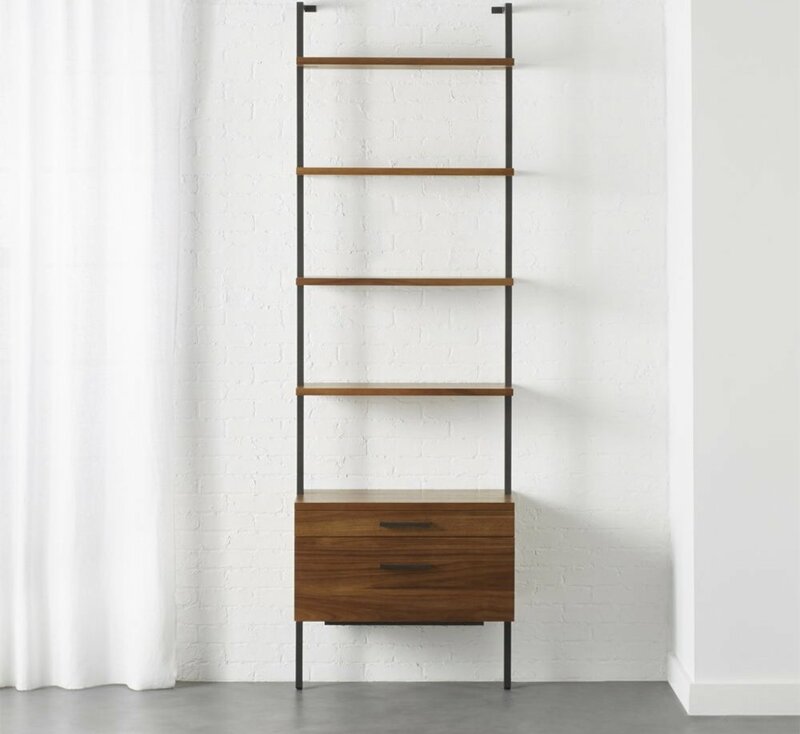 However, we ADORE these tall shelving units that are perfect for a living room space or a bedroom. These are intended as bookshelves but can be used to store or display other items. From a design standpoint they are sleek, contemporary, and just a bit industrial, so we love the aesthetic! Although our day-to-day style is not overtly glamorous (we usually opt for trendy but casual pieces that are a little bit edgy... but elegant or glamorous are far from my go-to styles). However, right now we're finding fun ways to sprinkle in the animal prints that are ubiquitous this season. My favorite way to incoporate this trend in a way that is consistent with my own style is to wear a leopard print top, but pair it with a faux leather moto jacket so the print is only subtly visible. Pair this with distressed denim and even throw on a pair of converse sneaks and you'll have a casual, edgy look with just a hint of glam!